1. You can select which home page modules you would like to appear. 2. You can customize the text and image of your welcome message module. In addition to your personal welcome message module, we have included three modules that we think your teachers will find helpful. One module links to the TIM website. 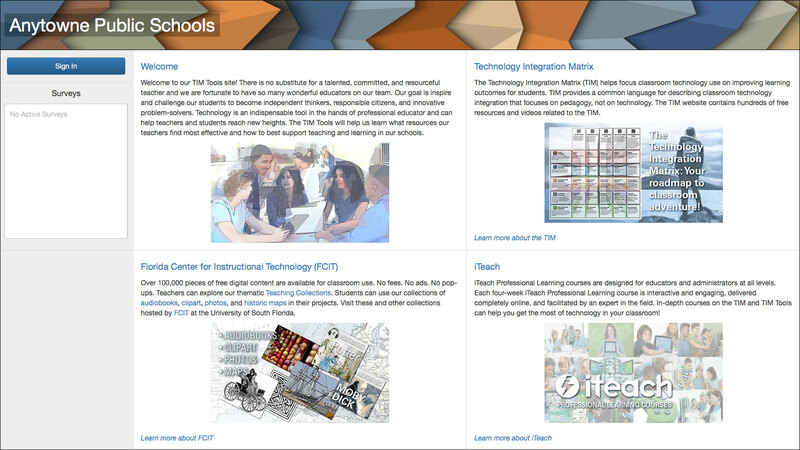 A second links to free FCIT digital content. And a third module links to our iTeach courses. Figure 1. 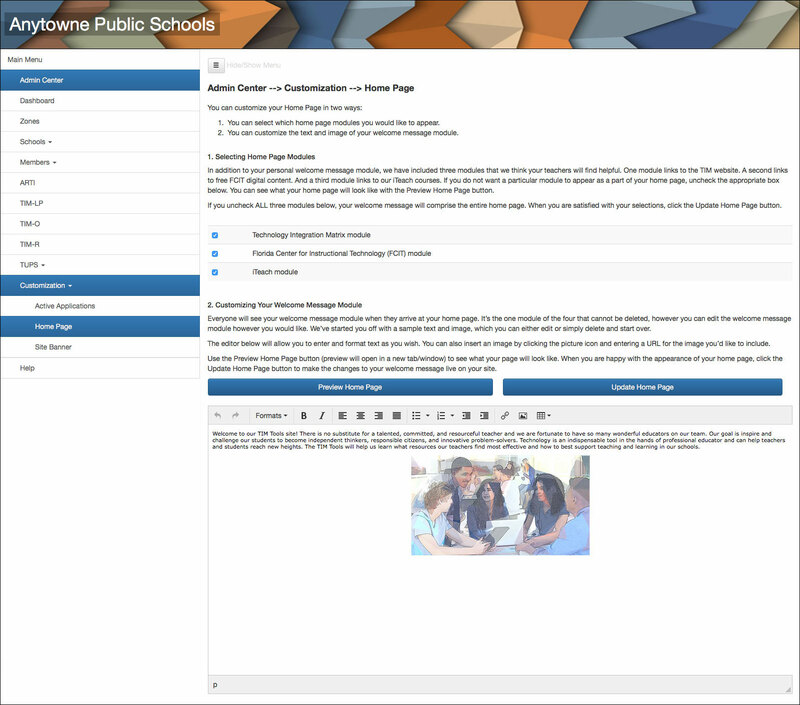 Default homepage with all four modules displayed. If you do not want a particular TIM-Tools module to appear as a part of your home page, uncheck the appropriate box in the Home Page window. Your changes take place immediately and just as easily can be reversed. You can see what your home page currently looks like to visitors by clicking the Preview Home Page button. The preview will open in a new tab/window. If you uncheck ALL three optional modules, your welcome message will comprise the entire home page. Figure 2. Selecting the modules to display on the home page (top). Welcome message editor (bottom). Everyone will see your welcome message module when they arrive at your home page. It’s the one module of the four that cannot be deleted, however you can edit the welcome message module however you would like. We’ve started you off with a sample text and image, which you can either edit or simply delete and start over. The welcome message editor will allow you to enter and format text as you wish. You can also insert an image by clicking the picture icon and entering a URL for the image you’d like to include. Use the Preview Home Page button (preview will open in a new tab/window) to see what your page will look like. When you are happy with the appearance of your home page, click the Update Home Page button to make the changes to your welcome message live on your site.